When the U.S. economy reaches the downslope of growth, on the far side of the boost from the Trump tax cuts, there is a great risk that we will be hurled into the first fiscal crisis that this country has ever experienced. The sad but disturbing truth is that we already meet three key conditions for a Greek-style fiscal crisis; in order to avoid such a crisis - the costs of which would be catastrophic to today's highly integrated global economy - we need all hands on deck. We need, most of all, a conversation about the risks for a fiscal crisis that is based on sound, solid analysis. Unfortunately, the theory and methodology that can provide this analytical firepower - political economy - is not very well understood in today's public policy conversation. Specifically, too many economists who participate in the conversation are stuck in their old-fashioned methodological mindset, thus severely limiting their contributions to the public discourse. Their contributions, in fact, are often compromised to a point where it is almost counter-productive to try to apply their material in the public conversation. This failure of the economics profession is particularly glaring in the context of a Greek-style austerity crisis in the United States. Economists have worked hard to establish their profession as the final arbiter on anything macroeconomic; as the risk of an austerity crisis rapidly grows, it would have been useful to have a cadre of economists participate. However, so long as they insist on doing so based on the methodology that has dominated economics for at least the past four decades, there is not much to expect from them. Their shortcoming is particularly disturbing when they purport to enter the domain of public-policy scholarship, wearing the old economics robes in a climate where political economy has superior suitability. As an example - and a prominent one - let me offer a small book from 2016 called U.S. Fiscal Imbalance. It is published by the Cato Institute and written by their director of economic studies, Jeffrey Miron. An economist by training, Miron also lectures at Harvard and publishes in peer-review journals. * With this book he tries - hard - to make a useful contribution toward the understanding of why the United States has a problem with a fiscally imbalanced government. The natural focal point of Miron's book is the term "fiscal imbalance". Already here, he gives away his economist stripes, specifically in pursuit of a definition that is statistical in nature, as opposed to institutional, which would be the natural starting point for an endeavor in political economy. This leads his analysis down the wrong path and, eventually, into an application cul-de-sac. Fortunately, his experience provides a learning lesson for political economists, econometricians and public policy scholars in general. His problems begin with his attempt to define "fiscal imbalance". Starting with trying to detach it from "fiscal solvency", he briefly gets lost in a discussion that is irrelevant for the end goal of his analysis, but offers a clue to his methodological error. because their trust funds could borrow from the rest of the government if the balances in the funds were negative. Equivalently, Congress would decide to pay Social Security or Medicare benefits out of income tax or other revenues. Indeed, Medicare is already funded partially out of general revenues. Stated differently, any dollar of revenue, regardless of its source, can pay for any kind of expenditure. a necessary condition for the total amount of government expenditure to make sense ... being in balance does not mean the expenditure for current policies is worthwhile, merely that the expenditure is not unaffordable. The criterion by which government expenditure is "affordable" is that projected revenue will pay for expected expenditure "indefinitely". Miron has now established how he views the fiscal imbalance problem in the U.S. economy: as a statistical mismatch between spending and tax revenue. This, however, is only a measurement of the underlying problem, namely the institutional design of the spending programs and the revenue collection system, a.k.a., our tax code. To further distinguish himself from the methodology of a political economist, Miron continues within the framework that would make an econometrician happy. His next stop is the budget deficit, which he dismisses as irrelevant in the analysis of the federal government's fiscal imbalance. Focusing strictly on the statistical definition of the deficit, he explains its uselessness by going all the way back to 1792. Based on the fact that Congress has balanced its budget for most of that period, he draws the conclusion that "the U.S. federal deficit displays little consistent long-run trend." Therefore, it makes no useful contribution to our understanding of our country's long-term fiscal problems. Here, it would have been relevant to observe how Congress has profoundly changed the very definition of the federal government's role in the U.S. economy. Miron notes that that government has grown enormously, but he does not link the deficit to that institutional metamorphosis. Instead, he simply suggests that "the deficit gives only the vaguest hint of the fundamental change in the role of government in the United States." This is a remarkable statement. The change in "size and scope" of government took place in the mid-20th century, starting with the creation of Social Security under the Franklin Roosevelt administration and accelerating dramatically under Lyndon Johnson. Contrary to what Miron purports, there is a strong correlation between government deficits and the dramatic expansion of the federal government, especially since the Johnson administration. Starting with the War on Poverty, federal government spending underwent an institutional metamorphosis. Its purpose was no longer to merely provide for the poor and the nation's defense, but to comprehensively redistribute income and consumption. Thus, when placed in its proper institutional context, the deficit is a good gauge of the "fiscal solvency" or "fiscal balance" of federal spending. Miron's methodological problem is that he, on the one hand, defines "fiscal balance" in dynamic terms, stretching his definition toward infinity, but then on the other hand dismisses key variables and metrics because they are static, by presenting them as static. In the case of the deficit, he claims there is no trend to be found and then criticizes the debt for precisely the same reason. 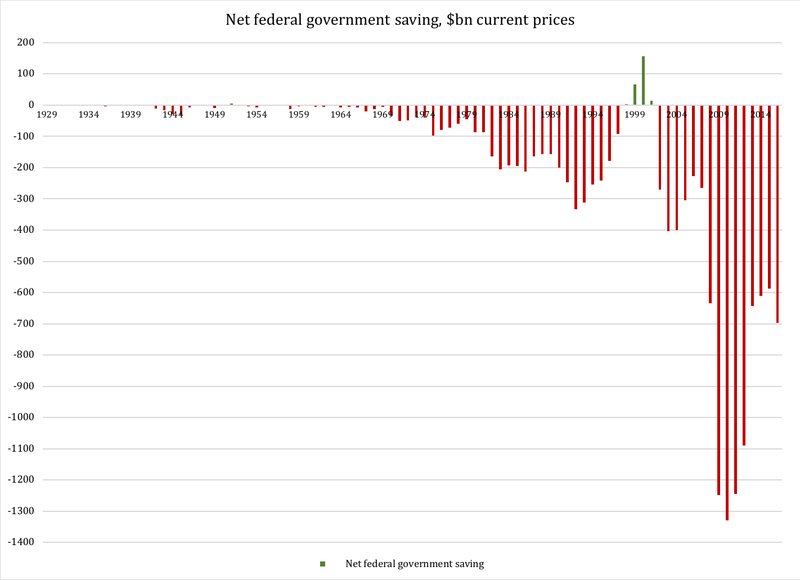 As Figure 1 explains, there is very much a deficit trend in the federal budget, and - logically - a corresponding trend exists in the debt as well. The debt is backward looking; it takes no account of what current policy implies for future expenditures or revenue. Any surplus reduces the debt, and any deficit increases the debt, regardless of whether that deficit or surplus consists of high expenditure and high revenues or low expenditure and low revenues. Similarly, whether a given ratio of debt to output is problematic depends on an economy's growth prospects. Here, Miron is of the opinion that principal and interest payments on debt are of no consequence to a government's fiscal future. With just a little bit of interest-rate upticks, Congress will soon find itself spending more just on interest on the federal debt than on national defense. With a return to historic interest levels above five percent, the cost of the debt - again excluding any attempt to pay it down - could exceed the cost of every other item in the federal budget except Social Security. Clearly, the debt does take "account of what current policy implies for future expenditures". Since current policy means maintaining current spending programs, the role of the deficit in the budget is a classic example of ceteris paribus: current policy assumes that all other expenditures in the budget remain unchanged, allowing the debt to very much influence government's future fiscal balance. Then, in a stylized example using a present-value definition of fiscal balance, Miron relies critically on the interest on the debt, i.e., the forward-looking component of the debt. Here, though, Miron runs into a problem. His present-value calculations take into account the interest rate on debt, which is an expenditure to government, and the interest rate on assets, i.e., government loans, i.e., a revenue to government. However, while the balance between interest rate payments in to and out of the budget are interesting from a theoretical viewpoint, and while they can help grasp the concept of present value in the context of the debt, it is not the interest payments that are the relevant dynamic variables in any consideration of fiscal balance. The real present-value variable is the growth rate of expenditures vs. revenue. Miron operates under the assumption that such variables either do not exist, or are trivial to any discussion of fiscal balance. He is, of course, badly wrong here: the most decisive factor of a government's fiscal balance over time is the difference in the growth rates of a government's spending and its revenue. What makes these variables especially important is the fact that they are almost completely independent of one another. Government spending grows according to the eligibility parameters that constitute entitlement programs. The eligible population, the amount they are entitled to (cash or in-kind) and any cost drivers, such as but not limited to government-defined COLAs (Cost of Living Adjustment), together determine the rate of increase in government spending over time. Tax revenue is determined by an entirely different set of parameters: the defined base of each tax, the tax rates and the growth in the economic activity that constitutes the tax base. Long term, all tax bases grow in a more or less stable relationship to Gross Domestic Product, GDP, which means that we could generalize GDP as the ultimate driver of tax revenue growth. Theoretically, growth in GDP coincides with growth in entitlement spending only by chance. In practice, when the entitlement programs that define the welfare state are egalitarian in nature - as they are in almost all Western welfare states, including ours - the growth in spending will generally follow growth in median personal income. Since median income, in turn, grows pretty much on par with GDP, then ceteris paribus the growth rates of government spending and tax revenue will be largely equal. Except, in this case, ceteris is not paribus. There are two ways in which, so to speak, all other things are not equal. First, the institutional structure of an egalitarian welfare state changes by necessity over time. It is inherent to an egalitarian socio-economic organization - think Scandinavian welfare state - that it gradually expands its domain within the economy. New entitlement programs are added, existing programs expand in eligibility and coverage. This is, again, not a premise we can exclude while analyzing government spending over time. It is a parameter that is inherent to the very nature of government spending: two thirds of all federal spending, and half of all state and local spending, is egalitarian welfare-state spending. Therefore, it is a cardinal mistake to disregard the long-term institutional expansion of government in a long-term analysis of government spending. By necessity, says this premise, government spending expands its share of GDP even if GDP grows at a constant rate. are there, well defined in economic theory and abundantly documented in the economic literature. There is only one reason to leave them out, and that is if one's methodology requires such an omission in order to yield meaningful results. A study of government spending over time, of the kind Miron has produced, does not fall into the category of narrow methodology and pursuit of an equally narrow - but for its purpose logical - definition of what constitutes an acceptable result. Miron's study is a study in political economy. Therefore, it must expand its scope and include all causal relationships that are relevant to any policy conclusions that follow. In other words, if Miron's purpose is merely to discuss the concept of "fiscal balance" for the sake of furthering economic theory or methodology, then his omission of essential macroeconomic causalities and institutional parameters, is explainable. If, on the other hand, his purpose is to provide material that can be readily used for the transformation of fiscal policy (which, needless to say, includes structural reforms to economic institutions) then his analysis has fallen short of its target. Since the Cato Institute is not known for discussing economics in the traditional academic setting, but is renowned for its public policy scholarship, I am inclined to conclude that Miron's purpose is one of public policy. It would be valuable to see an updated version of his study that takes into account the socio-economic organization we know as the welfare state, with its major causal links to and from the economy in which it operates.